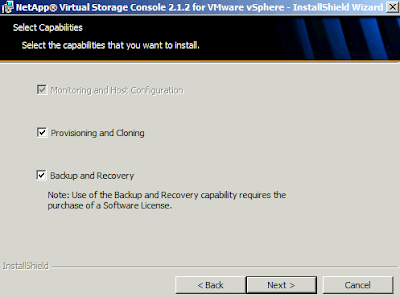 As a continuation from the previous post – NetApp Basic NFS Configuration Walkthrough with VMware – the following article provides a walkthrough installation of the NetApp VSC, and then using the VSC to optimize NFS settings on a VMware vSphere host. *This walkthrough uses the VSC-2.1.2-win64.exe, and installing here onto a VMware vSphere 4.1U1 vCenter. There is also a 32-bit version, and version 2.1.2 supports vSphere 5. *The capabilities include: Monitoring and Host Configuration (default,) Provisioning and Cloning, and Backup and Recovery (with license.) To use the VSC to optimize NFS only needs the default selection ticked; here though we might as well tick all selections to see the full feature set. iv) Register the plugin with vCenter at https://localhost:8143/Register.html and complete the vSphere Plugin Registration. Host name or IP Address: ??? Click 'Register' and if successful then the following appears "The registration process has completed successfully!" Finally reboot the ESX(i) host server to apply the changed settings! Highly recommend making sure that you log into the server you are installing VSC on as a local admin. Otherwise you will have installation issues. I use to support VSC at NetApp. Thanks a lot for the tips. I have got an issue, i have applied the settings on the host, rebooted it, but after an update (from VSC). The host need again a reboot :-/ Have you got an idea? Thank you very much for the comment. Post updated with the capital R.
Administration is open and accommodating. I have been leasing an unit here for a year, and am dependably content with the kind disposition of the staff and the cleanliness of the building. I like that each and every experience I have had with them was a positive one.